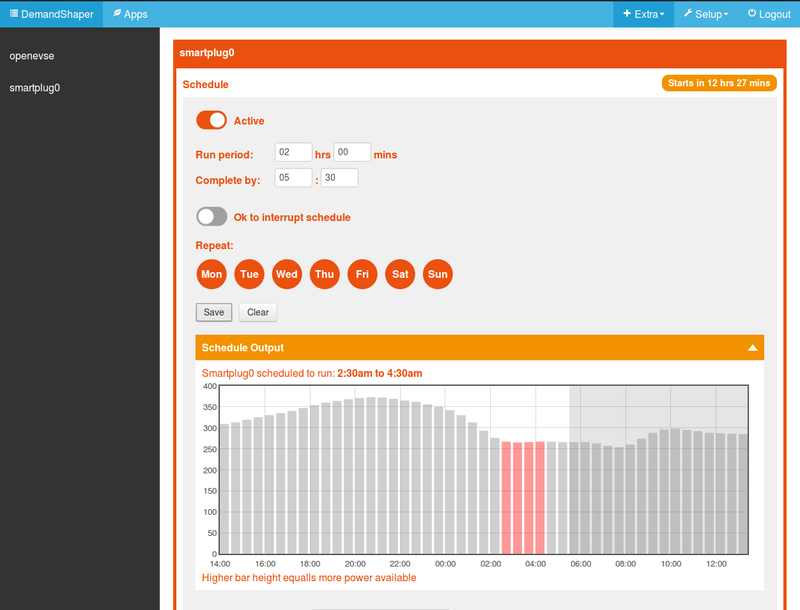 The emoncms demand shaper module uses a day ahead forecast and user set schedules to determine the best time to run household loads. 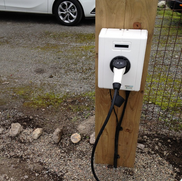 An example could be charging an electric car, the user enters a desired completion time and charge duration, the demand shaper module then works out the best time to charge the car, generally there will be higher power availability overnight and during sunny midday hours. The demand shaper attempts to avoid running appliances at peak times while ensuring that the appliance has completed the required run period. 1. The Sonoff S20 smartplug creates a WIFI access point, connect to the access point and enter home WIFI network. That is all the configuration required. What happened here? 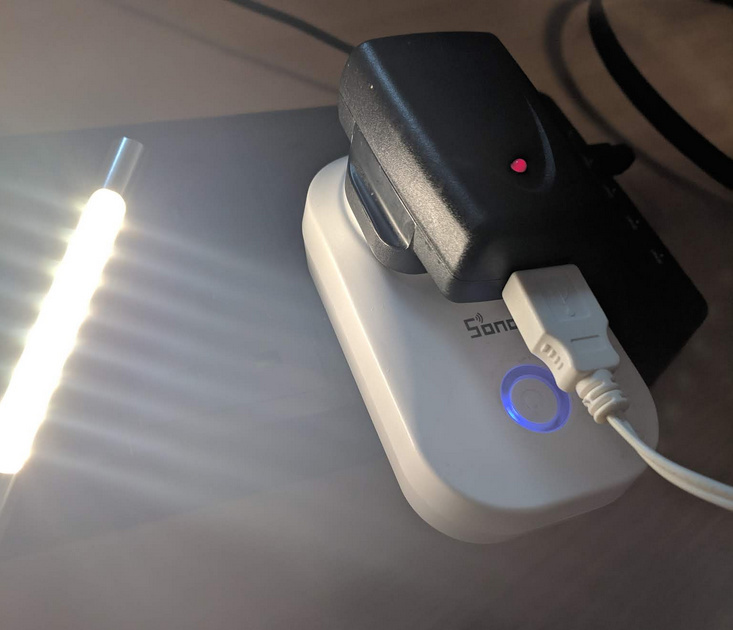 : The smart plug received the MQTT authentication details from the emonbase/emonpi automatically as part of a pairing process enabled by clicking on Allow. After connecting to MQTT the smartplug sent a descriptor message that automatically created and configured an emoncms device based on the smartplug device template in the emoncms device module. 4. Configure a schedule and wait for the plug to turn on! From my experience, the cloud cover forecasts compared to what is actually generated and when can be very different. Note I am referring to SE Queensland (Australia), so different forecasts. Even so I find it very challenging. I have tried using sky observing cameras, satellite images (30 minute delay) and the cloud cover forecasts. To date I have only achieved load matching with a level of priority. I hope this module works out well. Thanks @whatsupskip yes I imagine that integrating local weather forecasting will be the harder challenge this is a longer term goal for the module with the use of available forecasts (carbon intensity, octopus agile) the primary starting point. Do you have any examples of the differences in forecast and actual (both good and bad)? What forecast service did you use? To date I have only achieved load matching with a level of priority. 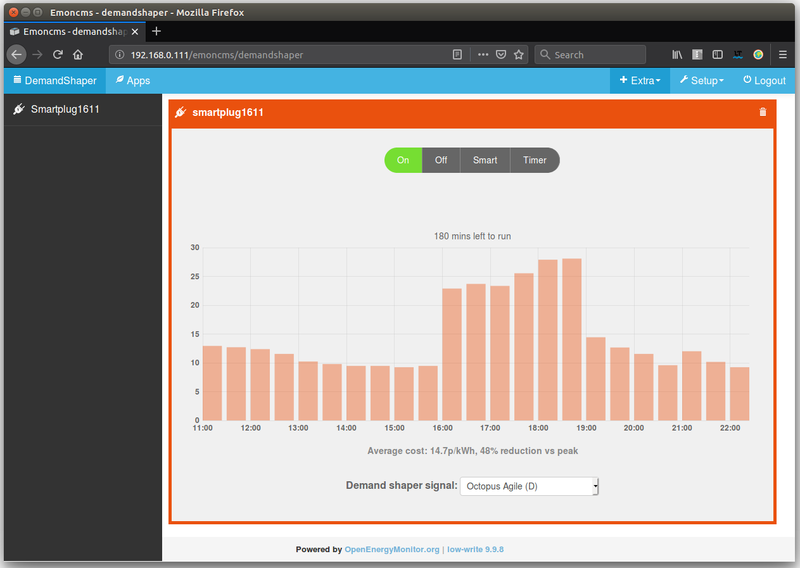 Making progress on the demand shaper module development. automated and regular schedule recalculation to attempt to improve schedule timing based on newer forecasts. re-scheduling of schedules in progress, take into account time already run and time left to run in re-scheduled run period. 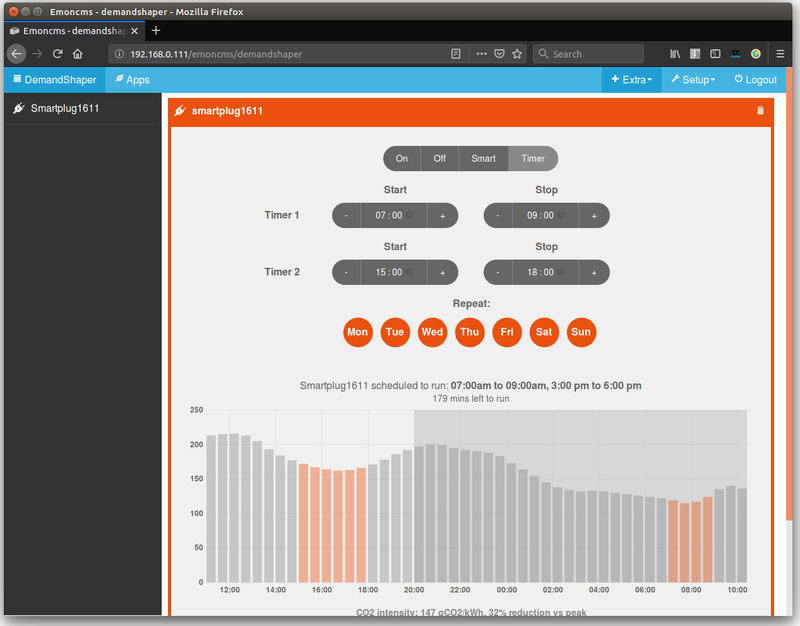 This is now implemented and in testing. I have been using the module to charge my EV via an EmonEVSE, setting the schedule every evening, e.g ready for 8am, charge for 1 or 2 hours. The module then finds the best time and reschedules multiple times as more up to date forecasts from the UK grid carbon API become available. It just so happens that the adjustments ended up coming back to the original schedule in this example, but that’s unusual. I’ve updated the original post above to reflect the current state of the demandshaper module. There has been a lot of work done to improve how the module works and talks to: smartplugs, openevse, heatpump control since the last update. EmonESP used by the smartplug, wifi relay and heatpump monitor now uses a timer based scheduling command rather than simple on/off state. This means that once the device has been scheduled by the demand shaper module, the device can continue to follow the last set schedule independently of the basestation. The latest EmonESP firmware allows for turning on/off the device and setting the timer in the EmonESP interface, the state is reported back to the demand shaper module, so that the state is kept in sync. 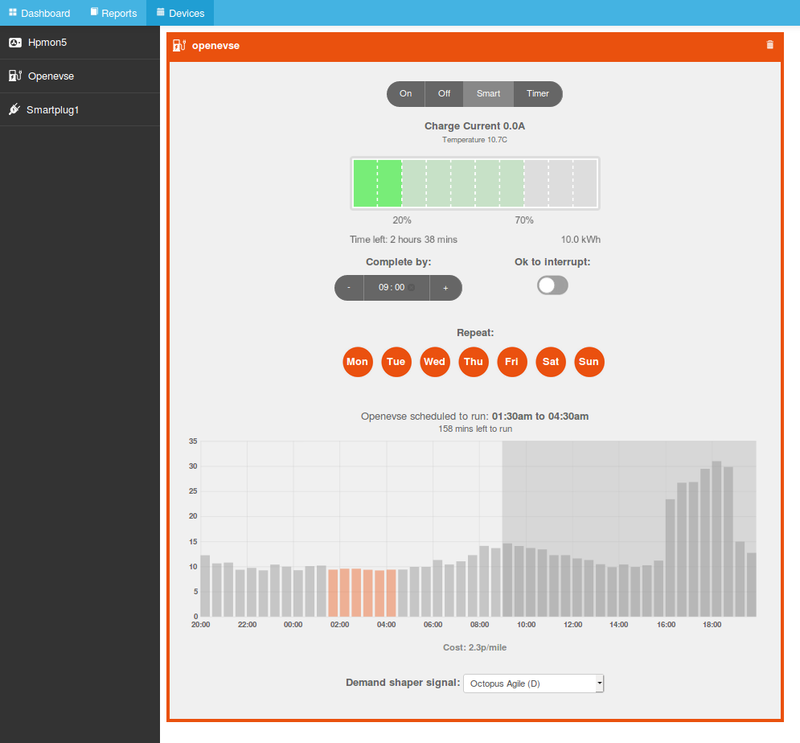 Initial device discovery is all done via the demand shaper module rather than having to go via the inputs interface. 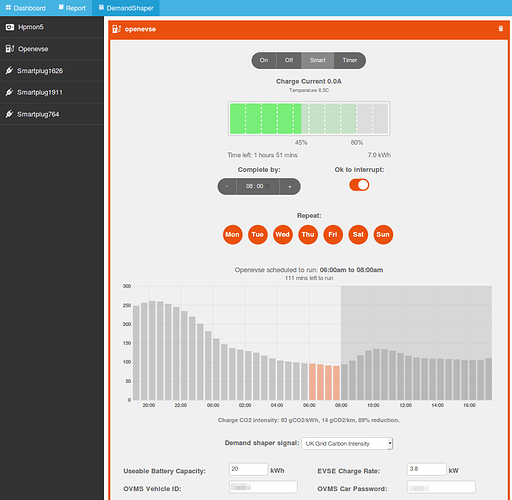 Enter the period and end time of the schedule you wish to set and the demand shaper module will do the rest, automatically optimising the schedule for the lowest cost or lowest carbon time. 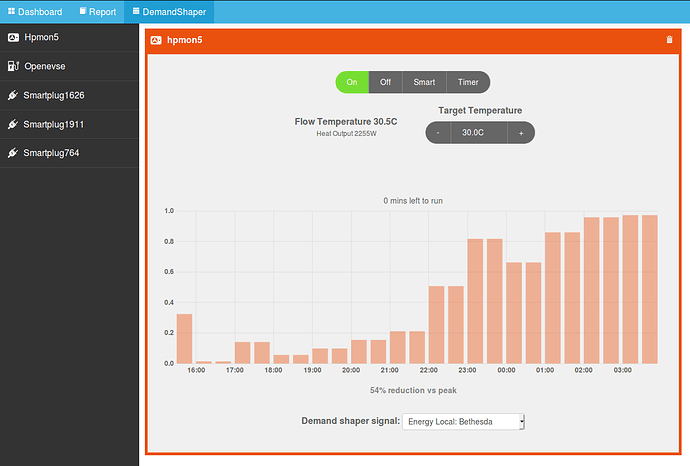 Integrates the ability to control a Mitsubushi EcoDan heatpump with FTC2B controller connected to the OpenEnergyMonitor HeatpumpMonitor. Flow temperature and heating On/Off is settable from the interface. 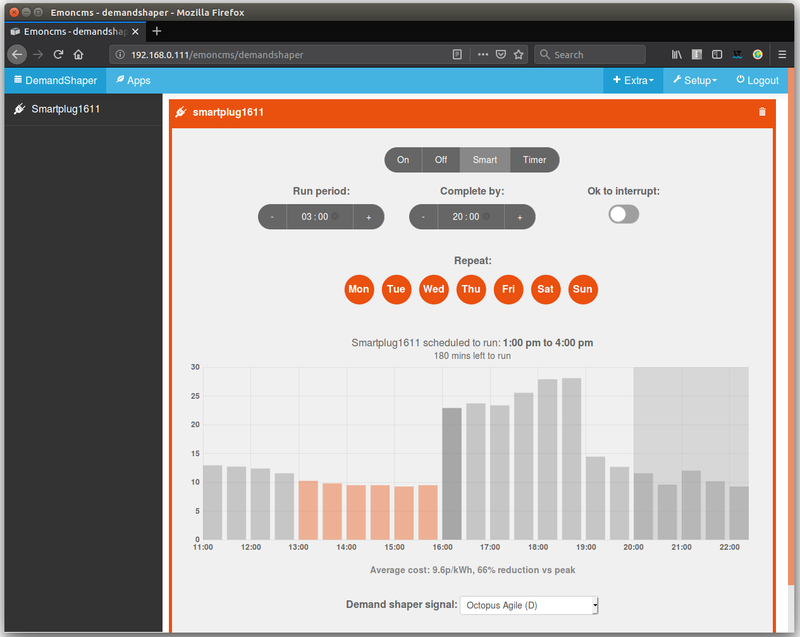 The heatpump control does not yet make use of the smart scheduling side of things, but that’s something I would like to explore in time. 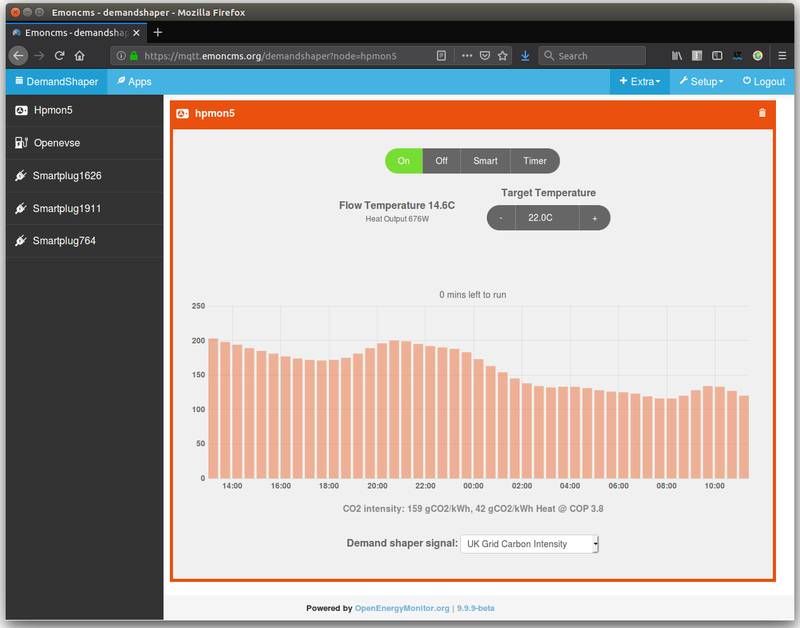 I use both the OpenEVSE and Heatpump control interface myself day in day out. Having everything in one place, being able to easily switch between heatpump and ev charge control and then to the heatpump app module dashboard is really nice. allowing for remote control of devices wherever you are. This can of course be done with services such as dataplicity as well. I currently use a mixture of both as I test & develop and where I need remote SSH access & full web ui access. The above is still work in progress. While a functional stage for initial testing, there is a lot that can be improved. Add settings for EV battery capacity and EVSE charge rate, so that charge period is calculated for different EV models and charge rates. Add balancing charge time when 100% charge is selected. Add option to favour charging nearer time of departure even if price is a little higher in order to reduce the amount of time the EV battery is at a high state of charge. Perfect for electric vehicles, storage heaters, or anyone who can shift their electricity use outside of the 4pm – 7pm peak. Reporting of scheduling results, e.g this month on average you charged the car at 140gCO2/kWh or at 10 p/kWh. Graph of averaged daily charge profile to demonstrate reductions in peak-time consumption. Example of controlling the WIFI Relay module for hot water heating, incorporating temperature sensing in order to calculate ‘state of charge’ of hot water cylinder and therefore ‘charge time’ for use with the demand shaper algorithm. The same approach could be used with storage heaters. This all looks great, just what I am needing, thanks for all the effort. I have one other smartplug scenario I personally would like to see. A setting where a plug is on except when electricity cost is above a certain threshold with perhaps a safety setting where off time cannot exceed a second threshold. I see this used for freezers and dehumidifiers. We live in an old damp cottage and use dehumidifiers. They don’t come on very often but as we are just about to go on Octopus Agile tariff it makes sense not to let them come on at peak cost.